Located on Pune-Manmad highway, Hotel Om Sai International is a very popular three star hotel that offers comfortable and lavish accommodation choices to guests visiting the holy pilgrimage destination of Shirdi. The key feature of this hotel is its client centric approach, which ensures that every aspect of the hotel is designed and offered in such a way that it meets all requirements and exceeds expectations of clients. This coupled with premium amenities and competitive pricing makes Hotel Om Sai International a favorite among tourist and business guests. On accommodation front, the hotel offers 58 well maintained and designed rooms in three separate categories of Standard Room, Superior Rooms and Deluxe Rooms. 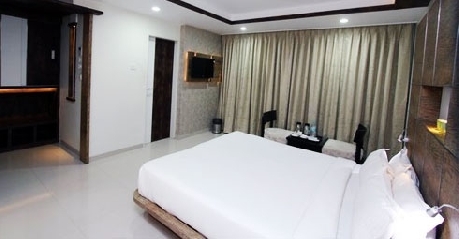 All the rooms are furnished with premium options and materials and are equipped with best of facilities to ensure complete client satisfaction. The rooms are also provided with best of modern amenities, which is sure to keep guests pampered and satisfied during their stay here. To cater to food related requirements of guests, Hotel Om Sai International has developed an onsite multi cuisine restaurant that serves an array of Indian, international and local delicacies. Apart from this, the round the clock coffee shop serves hot and cold beverages along with several options of snacks and mini meals to keep guests full through the day. 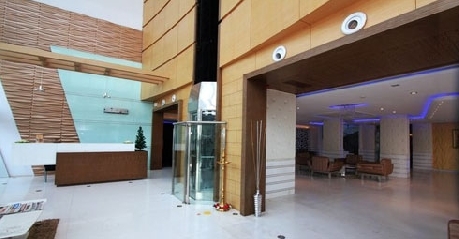 Other facilities offered by Hotel Om Sai International include high speed internet access through Wi-Fi, water sports, handicap friendly facility, doctor on call, laundry, travel desk, taxi services, parking facility, Railway station or airport transfers, guide and sightseeing facility. Located on Pune-Manmad highway, Hotel Om Sai International is a very popular three star hotel that offers comfortable and lavish accommodation choices to guests visiting the holy pilgrimage destination of Shirdi. The key feature of this hotel is its client centric approach, which ensures that every aspect of the hotel is designed and offered in such a way that it meets all requirements and exceeds expectations of clients. This coupled with premium amenities and competitive pricing makes Hotel Om Sai International a favorite among tourist and business guests. To cater to food related requirements of guests, Hotel Om Sai International has developed an onsite multi cuisine restaurant that serves an array of Indian, international and local delicacies. Apart from this, the round the clock coffee shop serves hot and cold beverages along with several options of snacks and mini meals to keep guests full through the day. 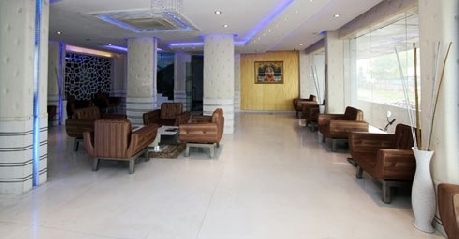 Other facilities offered by Hotel Om Sai International include high speed internet access through Wi-Fi, water sports, handicap friendly facility, doctor on call, laundry, travel desk, taxi services, parking facility, Railway station or airport transfers, guide and sightseeing facility. Standard Rooms are the most basic accommodation option offered by Hotel Om Sai International in Shridi. These rooms are aimed at solo travelers and guests who are looking for a budget accommodation option that caters to all their needs and requirements. Therefore the room is designed as per contemporary décor theme that is complemented by classy interior and artistic artifacts as well as paintings. The Standard Rooms are furnished using premium materials, which gives it a very up market feel and appeal. 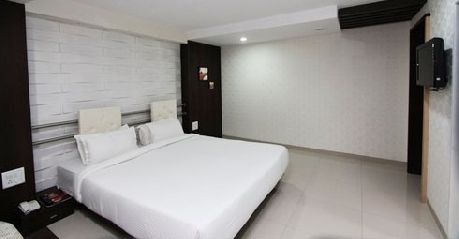 Apart from this, the rooms are also equipped with best in class amenities and features to keep guests pampered and satisfied during their stay here. The major among them include air-conditioning, cable tv, intercom telephone facility as well as direct dial telephone, mineral water, sofa, study table, daily newspaper, safe deposit locker or electronic safe, room heater, lavish and spacious bathroom with shower area, hot & cold running water, geyser in bathroom, bathroom toiletries and room service. Such premium amenities at an unbeatable price, is what makes Standard Rooms offered by Hotel Om Sai International stand out and apart from others in the region. Looking for a comfortable and well maintained accommodation option in Shirdi? 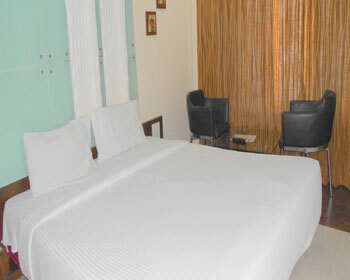 Then you will surely be impressed by the Superior Rooms offered by Hotel Om Sai International. The Superior rooms are designed by expert architects and decorators keeping in mind diverse requirements of modern day travelers. The Rooms have contemporary setup that is enhanced by premium interiors and artistic paintings. The Superior Rooms are furnished with best of furniture and materials to give it premium feel and appeal. The other amenities and facilities provided as part of Superior rooms are air-conditioning, cable tv, intercom telephone facility as well as direct dial telephone, mineral water, sofa, study table, daily newspaper, dining table, safe deposit locker or electronic safe, room heater, lavish and spacious bathroom with shower area, hot & cold running water, geyser in bathroom, bathroom toiletries and room service. Classy accommodation setup and unmatched comfort amenities are two factors that make Superior Rooms ideal stay choice for pilgrims traveling to Shirdi. 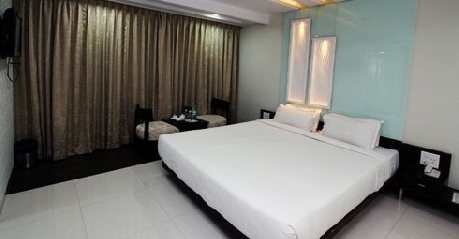 Deluxe Rooms are the highest category of accommodation choice available at Om Sai International Hotel in Shirdi. 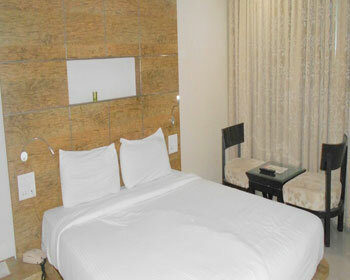 The Deluxe Rooms are designed for guests who value their luxuries and indulgences and do not mind paying extra for it. These rooms are quite spacious and consist of a separate living area, bedroom and an attached bathroom with premium amenities and facilities. Designed by experts as per contemporary décor style, the Deluxe Rooms are sure to cater to different taste and specific needs of high profile guests. The interiors are adorned with classy artifacts and paintings, which imparts cheerful ambience to the room. Other facilities and amenities included in the room are air-conditioning, cable tv, intercom telephone facility as well as direct dial telephone, mineral water, sofa, study table, daily newspaper, dining table, safe deposit locker or electronic safe, room heater, lavish and spacious bathroom with shower area, hot & cold running water, geyser in bathroom, bathroom toiletries and room service. If you are a foodie and are keen to try new cuisines and exotic delicacies from across India and the world, then the multi cuisine restaurant at Hotel Om Sai International will surely please you. 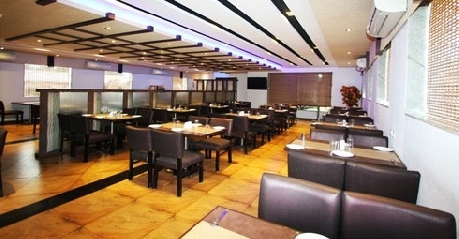 The diner is located on the premises of the hotel and serves an array of Indian and international dishes along with specially crafted menu of local items. All the food prepared at the restaurant is done as per traditional recipes using organic ingredients, which brings out authentic flavor and aroma of the dishes. The restaurant also has well crafted interiors and décor theme, which enhances the overall dining experience of the guest. This along with high hygiene and cleanliness standards inspires lot of confidence in the quality of the food served at the diner. Attentive service and warm staff makes sure that you feel completely at home and fully satisfied with food served here. Be sure to try local delicacies served here, they are worth a try. If you are one of those people who suffer from untimely hunger pangs or have a very packed schedule to keep, you are going to love the Coffee Shop at Om Sai International. The Coffee shop offers an array of hot and cold beverages along with an assortment of snacks and mini meals that help keep patrons full and satisfied during the day. Quick service and round the clock availability of eatables has made the coffee shop a favorite among business guests.